I couldn't resist starting this chart that I got from Katrina's Sale Blog. If you haven't been there yet, you must check it out. She's got some great deals! The chart is "Love and Wisdom." 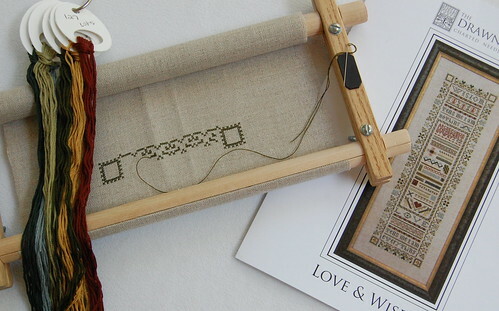 A long band sampler full of specialty stitches. I had all the the NPI and a cut of 32 ct. Natural Belfast that was the perfect size, so I thought "Why not?" I found out through Amy that these Rolaframe scroll frames are still being made and she's planning on carrying them in her shop. I was very happy to hear this. I like them better than the EZstitch frames because they are so lightweight and so easy to use! I did stitch a little on "Finch Song" last night. Not really enough to show a pic. I'm just working on the hill. Lots of green! :) Write soon! I see that you're using your scroll frame again on this one, yet I seem to remember you saying that you usually stitch in-hand?? (Sometimes I have weird dreams, lol!) So, if you did say that, are you reforming your M.O., or do you just use the frame on unusually large pieces? This project looks pretty and like another fun stitch! I can hardly wait to start The Riddle. I will have to check out the frames as well as the links you put in. Your blog is like reading a good book. You love seeing what will be posted next. You inspire me with your lovely stitching!! I see your plan now -- you're going to torture us with lots of Drawn Thread finishes! Mwah ha ha! :D Looks great so far! I always like seeing what you're up to. I've been dreaming Riddle since your finish, I'll have you know. I missed your post on the Riddle finish, but have to tell you that now that I've seen it, I'm really in awe. I love it - the colors are so fresh and your stitching is so nice! your projects are always so beautiful!!! Keep up the great work!!! You're off to another great start, Nicole! DTs are so pretty--I just love the colors. You are so inspiring!! Love your work. I love this Drawn Thread Nicole! It will be another beautiful piece by you I am sure...I need to research the roll bars..I like the idea and especially if they arent goo heavy...thanks! Gorgeous start!! Looking forward to watching you stitch this one! Hey, Nicole, thanks for the heads up on the frames. I ordered a set from Amy. I love them. I never have been able to get my fabric straight on other roller frames. These worked perfectly. I see another purchase in the future. Nicole: After reading your comments about the Rolaframe scroll frames, I purchased a couple of sets of them. I haven't had a chance to use them yet, but am looking forward to transferring a couple of my projects over to them. My question is: Can you take these scroll frames in your carry-on luggage? I am traveling to Seattle to see my sister and I'm not checking bags. I wanted to take these new frames and show my sister what they look like. I would hate for them to be confiscated going through Security. I have no idea, as I've never taken them on a plane. To be safe I would put them in your baggage until you know otherwise. HTH!